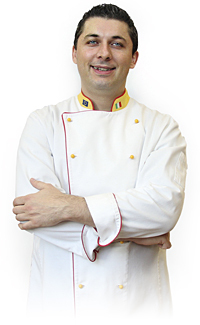 Maurizio Ferrari is MENU's official traveling chef. An Italian native, Chef Maurizio's birthplace of Finale Emilia is nestled next to the famous birthplace of Balsamic Vinegar, Modena - Italy. Raised in the rustic, northern province's traditions, Chef Maurizio grew to love the rich, authentic Italian culinary style. Exuding passion and love of the art, he embodies the quality cooking and creativity that the MENU brand stands for here in North America. Holding a degree in Hospitality from CFP Nazareno in Carpo – Italy, Chef Maurizio's career encompasses over 15 years of extensive experience in the culinary and hospitality industries. Managing restaurants and kitchens across four continents, his creation and plating ability is exemplary. Among his many highlights was the honor to work with the Italian National Sports team from 1998 - 2000, through two Olympics and a World Cup. Chef Maurizio's passion is exemplified by his ingenuity in the kitchen, ability to educate customers and clients and the camaraderie with other chefs, sharing priceless time-saving tips and kitchen secrets. With an unwavering adherence to a high-end standard, Chef Maurizio prides himself on utilizing an international palette to bring together modern Italian fusion dishes. Continuing along his diverse culinary career, Chef Maurizio is now proud to partner with the MENU brand. Giving him the opportune charge of working with a quality brand that is renowned throughout Italy, claiming 30% market share of the restaurant industry. Quickly becoming the staple Italian line here in North America, Chef Maurizio will work with the MENU line expansion as a storyteller, product educator, partial sales promoter and, of course, innovative Chef.